← New EAP build of IntelliJ IDEA 11 is available on 11.11.11! 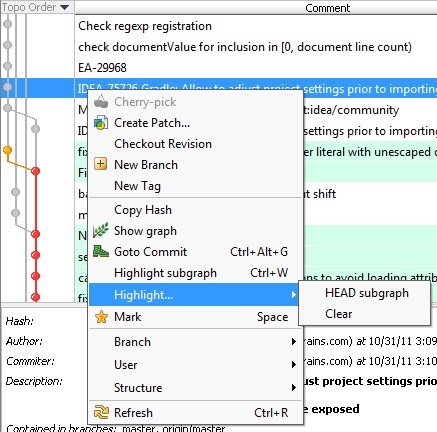 The most exciting news for me is that now in forthcoming IntelliJ IDEA 11, we show Git revisions graph! Now that IntelliJ IDEA can visualize commits links, we’ve added context actions to tag a commit, create (and checkout) new branch, and checkout a selected revision. I want to specifically mention the highlight actions — now you can see what commits are in “ancestors subgraph” for a selected commit. By default, IntelliJ IDEA shows HEAD subgraph, i.e. you see what commits you have in your working tree now. It is really convenient when you are checking what commits went into some tag (or branch). 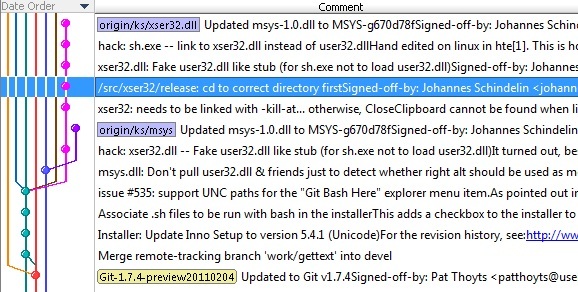 To find any commit in git log (in already shown part), use the new “Goto Commit” action — type commit hash, or description fragment, or branch or tag name, and be navigated to it. And, finally — when browsing history, sometimes you work with a set of commits and need to track this set. Now you can mark commits by simply pressing Space and they get stared. This entry was posted in New Features and tagged Git, Nika, VCS. Bookmark the permalink. Nice! IMHO the graph should be anti-aliased. Sorry, I’ll say another one: Awesome! When will this be in the EAP? Please! Add same love to mercurial plugin. _HG_ is new SVN for corp developers, not git. Is there anyway that we can have a similar visual graph of commits for a very specific source file so we can see its activity across branches? For instance, in IntelliJ CVS integration we can right mouse click on a file and show CVS history, it shows all the revisions for the file across branches. Would love to have something similar with the Git integration. The same for Mercurial please!!! Great feature, very good. But a bit slow yet. On the repository of 5895 commits it takes quite a while to load the graph. Are there plans to improve performance in pipeline, or should I create a ticket for that? @Yann, you can see file history exactly the same way as for CVS. @Irina, it does show the file history for the current checked out git branch, but what about changes that are on other branches? You don’t see them, unless I have missed something. Awesome… But a little bit slow! @Irina what do you think of the following ideas? 1) Add another VCS Git action on a file alongside show history, something like Filter in Git Log so that it does filter the log for the selected file so you don’t need to navigate in the actual Git log to find the file to filter on. 2) Add an option in the Git Show History so that you can add the –all in the git log command and you then render a new column that shows the branch name (if you could show as a tree like in the CVS show history that would be awesome). 1) Yes, it’s a good idea! We also wanted to do this. It just haven’t been done yet. Branches that commit belongs to are shown in the bottom of the details pane (“Contained in branches”). It would kill performance if we show branches for every commit just in separate column. We just show branches for the selected commit, and cache them for the case if you select that commit again. Also, as I have said above, for the case when you don’t filter results, you can highlight all commits belonging to a branch. NB We had some questions concerning the place where revision graph and git log is located in IntelliJ IDEA (and other products).